I am sure you have seen a domino display, where a flick of a finger sets off a chain reaction that provides a spellbinding few seconds or minutes of hundreds of thousands of plastic rectangles that go flying. What one rarely sees is the exacting construction of the display, which, while not as exciting as the ultimate result, is nonetheless fascinating. 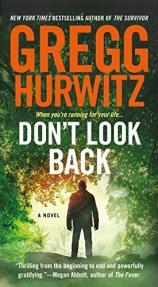 I thought of this while reading DON’T LOOK BACK, the latest thriller from Gregg Hurwitz. An initial slow burner that sizzles before exploding, it is Hurwitz’s best novel to date, full of explosive suspense and roller coaster terror. DON’T LOOK BACK starts off sedately enough. Eve Hardaway had planned a trip as an anniversary present to herself and her husband to a so-called eco-resort, charmingly named Dias Felices Ecolodge,in the jungles of the Mexican state of Oaxaca. After the marriage crashes and burns prior to the commemorative date, Eve, now a single mother with a precocious seven-year-old, decides at the last moment to take the trip by herself. Thus she arrives at the ever-so-green vacation spot as part of a disparate group of six people. Readers might be forgiven if they initially feel --- wrongfully but understandably --- as if they had stumbled into a cross between Who’s Afraid of Virginia Woolf? and The Night of the Iguana. Hurwitz takes about a fourth of the book to explore the different personalities of those assembled while providing a fascinating social and geographical tour of Oaxaca, which is worth the price of admission all by itself. "Hurwitz keeps moving the walls around throughout the story, so that by the time you are halfway through, you’ll have no idea what is going to happen next or to whom, other than it is more than likely going to be extremely, almost unimaginably bad." However, a note of foreboding is injected when Eve, on a nature call during one of the jungle tours, accidentally observes a strange man in the wild engaged in some bizarre and apparently secretive actions. While hiding from him, Hardaway discovers a digital camera bearing the name “Theresa Hamilton.” Eve subsequently learns a number of unsettling things about Theresa Hamilton: she was a guest at the same resort where Eve is staying; she snapped a picture of the stranger who Eve spied in the jungle; and she has been missing ever since she abruptly left the resort. Things take off pretty quickly from there, with Hurwitz, plot-wise, not only setting the dominoes in motion but also jumping into the middle of the display and tap-dancing while lobbing live hand grenades at you, the audience. Surprises abound, some of which you’ll anticipate, but many of which you won’t. Alas, you will guess incorrectly about most of what occurs. That Virginia Woolf and The Night of the Iguana mashup I mentioned all too soon turns into Deliverance meets The Ruins (without the supernatural aspects) with a dash of Titanic and Friday the 13th thrown in for good measure. Yes, it’s that good. Take a group of innocents abroad who never really jell, put them in the middle of a torrential rainstorm that cuts them off from anything close to civilization, and then have them taken off the board, one by one, and you have a pretty good, though very incomplete, idea of what this book is all about. By the time you read the last paragraph, your world --- and that of the characters, at least the fortunate few who make it to the end --- will be turned upside down. You will avoid bridges, jeeps, huts in the middle of nowhere, vacations and Mexico. You also will probably begin sleeping with a light on, underneath a mosquito tent with a can of Raid and a shotgun at the ready. It won’t be enough. Hurwitz did yeoman’s work researching the extensive flora and fauna that forms the beauteous and dangerous backdrop for DON’T LOOK BACK, and it certainly shows, particularly in his descriptions of such things as “sweeper ants” and a plant known as “mala mujer” (the latter of which I have run into on several occasions myself, though not in jungles). However, the true beauty of the book is its structure. Hurwitz keeps moving the walls around throughout the story, so that by the time you are halfway through, you’ll have no idea what is going to happen next or to whom, other than it is more than likely going to be extremely, almost unimaginably bad. Don’t miss this one; it’s a great book for the closing days of summer. Just be sure to read it before you pick your destination.